While not an easy job, some days dentistry is one of the most rewarding jobs on the planet, and today was one of them! Cosmetic dentistry can take many forms, but when it involves multiple different procedures and materials, it can be an hugely challenging job to make it all turn out just right. In our Charlotte dentist office, we use the most modern technology and teamwork and skills to make this happen, and today was a perfect example of how it should all come together for a beautiful smile. When Anya first came to us for a consultation, it seemed fairly routine – she had a 10-year old porcelain crown that had a chipped corner, and she didn’t like the gap between her 2 front teeth. So I recommended some bonding on the left front tooth and having my lab make a new porcelain crown for the right front tooth. While I love our CEREC Same-Day Crown system, I felt we’d get the best result with a skilled porcelain artist, aka a lab tech. But as I got up, I noticed she seemed upset, so I asked what was wrong, and she told me of how bad the experience was the first time she got the crown done, and I realized we couldn’t do that to her again. The challenge was then – make as perfectly matching a new crown as we could in ONE VISIT, plus close the space between the teeth. And if there’s one thing I like, it’s a challenge! Here’s our expert lab technician, Lindy Sikes, hard at work tweaking things to be juuuuuuust right! And once we knew it was looking awesome, we asked Anya if she liked it, and she said yes, so we bonded the crown in and voila! 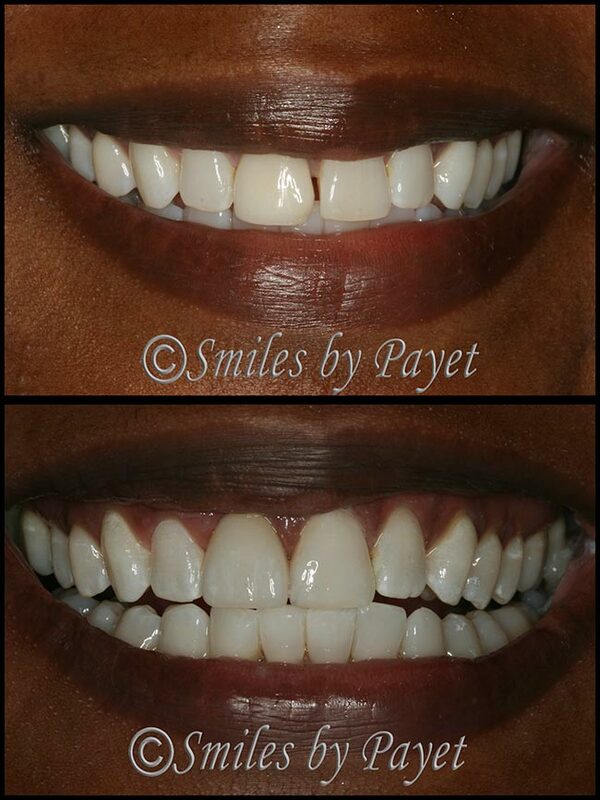 In just 1 appointment, we replaced the old crown and closed the gap so perfectly, even I have trouble seeing them!